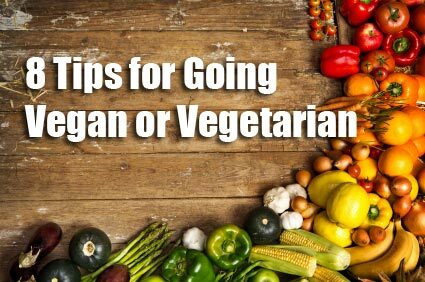 I know that some of you may be considering going Vegan or Vegetarian, so I want to give some tips on transitioning to a plant-based lifestyle. How many excuses have you come up with for not going vegan or vegetarian? If you’re like many people, you have talked yourself out of it time and time again. Maybe you feel that eating a solely plant-based diet is just too difficult or that you won’t be able to eat out, socialize with friends, or enjoy the foods you love. For these reasons and more, people have either avoided veganism/vegetarianism altogether or given up after a short stint. Research –There’s no way you can go vegan or vegetarian without doing some research and planning. Browse online for recipes or buy a cookbook to learn a wide variety of vegan recipes. Research vitamins and nutrients as well. What you find out will help you understand how this lifestyle change will benefit your overall health longterm. Plan – When you fail to plan, you plan to fail. Create menus and grocery lists to take the guesswork out of shopping and preparing meals. Purchase plenty of snacks to keep handy in case of cravings or unexpected hunger. Take some time to research restaurant menus too. When you know what you can order before you sit down, you will be less likely to stray. Take Small Steps – Instead of switching to a 100-percent vegan or vegetarian lifestyle instantly, make gradual changes. Start by preparing one vegan meal daily and add more vegetarian choices to your diet as you progress until you reach your goal. You can also start by eliminating one type of meat or animal product each week. Eat Healthy Food – Even as a vegan or vegetarian, you can make unhealthy food choices. For example, many sugary junk foods are, for all intents and purposes, vegan. However, if you eat too much junk, you will be sluggish and tired. You may even gain weight and become less healthy than the former carnivorous you. Always choose healthy meal options and snacks. Be conscious of what carbs and starches you are eating as well as processed foods and junk foods.